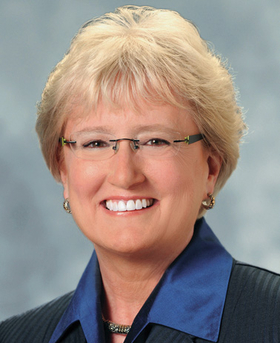 Nancy Schlichting, retiring CEO of Henry Ford Health System will be nominated to the board of for-profit TeamHealth. Activist shareholders of TeamHealth, stating the company has made “some missteps in critical areas including strategy and governance,” are asking for three seats on its board of directors. The seats would go to Nancy Schlichting, the outgoing CEO of the Henry Ford Health System in Detroit, a partner at hedge fund firm JANA and a former chairman of CVS Caremark. In a regulatory filing on Feb. 16, JANA said that TeamHealth's mismanagement had lead to the physician staffing firm's stock being undervalued. JANA reports that it spent $231 million to acquire 5.9 million shares of TeamHealth or 8% of its common shares. Schlichting has bought another 12,125 shares. Nashville businessman and former CVS Chairman Edwin Crawford purchased 82,251 shares. New York City-based JANA said that it will nominate Schlichting, Crawford and JANA partner Scott Ostfeld to be voted on to the board at the upcoming annual shareholder meeting. In its statement today, TeamHealth said the nominating/governance committee of TeamHealth's board of directors will review JANA's nominations and make a recommendation “it believes is in the best interest of all TeamHealth shareholders.” The board now has 10 members. Schlichting is expected to retire from Henry Ford this year. Wright Lassiter is her successor. Schlichting became CEO of the not-for-profit five-hospital system in 2003 and is largely credited for helping turn the system around, increasing its market share in the past decade. She told Crain's Detroit Business that she planned to stay in Detroit and possibly join more local boards. TeamHealth is based in Knoxville, Tenn.
Schlichting declined to comment on her possible board seat at TeamHealth when reached through a Henry Ford Health spokeswoman. The JANA board proposal is the second serious attempt in less than six months to shake up TeamHealth. In October, rival Amsurg of Nashville made an unsolicited bid to buy TeamHealth for $7.8 billion in cash and stock. TeamHealth rejected the overture and Amsurg dropped the offer. The Amsurg bid followed TeamHealth's announcement in August that it was buying another giant physician staffing firm, IPC, for $1.6 billion. During an earnings call with analysts this week, TeamHealth CEO Mike Snow said integrating IPC into TeamHealth and raising its margins were the company's chief priorities this year. Snow went out of his way during that call to bring up a special advisory committee of the board that was created around the time of the Amsurg bid. The committee was focused on finding ways to raise shareholder value, and Snow said it was active and engaged in its work. He did not, however, mention the JANA proposal. TeamHealth completed the purchase of IPC in November. In 2015, TeamHealth posted net income of $82.7 million, or $1.15 per share, compared with $97.7 million, or $1.39, in 2014. Revenue in 2015 was $3.56 billion vs. $2.82 billion in 2014.